An entry into Win A Glove For Your Team by Harrisburg’s Presley Witt resulted in Witt’s entry being selected out of the 70,000 entries as the Hornets’ baseball team were given new Wilson A2000 gloves by representatives of Wilson Sporting Goods last Wednesday in Harrisburg. Wilson has had glove day in the major leagues for years but was trying to come up with a way to do something at the high school level. 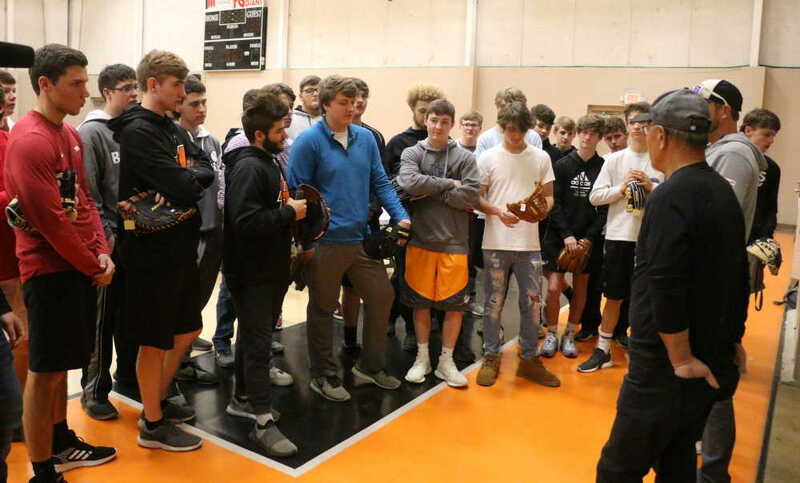 “We decided to have a glove day for a high school baseball or softball team so we decided to have a contest,” Wilson Senior Marketing Manager Jennette Rauch said. Rauch said after the winner was randomly picked, she contacted the school to let them know. “Nobody at the school wanted to believe it was real. I talked to the athletic director and the baseball coach before they confirmed it with Witt that he did enter the contest,” Rauch added. Rauch said when they had their big meeting after the winner was selected, other areas wanted to get involved. “We had hats, t-shirts and Evo Shields sent with us to give out with the gloves,” Rauch said. As the Wilson reps got the gloves and other items set up, there was nothing but smiles on the faces of the Harrisburg players. Then the time came for the players to go up and get their gloves. There were infielder gloves, outfielder gloves, catcher’s mitts and first baseman gloves. As the players came up, they were asked their positon and then directed to the glove selection. Shigeaki Aso, Master Craftsman with the company was on hand to help the players. Aso, who is also known as The Glove Guru, has worked with the Wilson Company for 42 years. Asked about some of the players he’s worked with over the years, he named Barry Bonds, Greg Maddux and Barry Larkin. Connor Castle selected the A2000 1786 model glove. “This was the first glove I designed,” Aso told Castle. Aso worked with several of the players showing and telling them the best way to break in the gloves all the time with a smile on his face. Aso was asked how a day like today differs from working with the major league players. “This has been such a fun day for me. It’s been like Christmas day for these kids and I got to be Santa Clause,” Aso said. Harrisburg head baseball coach Greg Biggers was excited for his team too. “A lot of these kids could never afford a glove like these,” Biggers said. “It’s really been like Christmas day around here and the smiles on the kids’ faces have been priceless,” Biggers added. Witt was asked how he entered the contest. “I saw the link in my email one day and my first thought was about the team and I bet most of the guys on the team could use a new glove. So I filled the entry form and sent it in,” Witt said. “Our season has been up and down so far, maybe this will give us a boost to finish the season strong,” Witt added.